I enjoy writing letters. I love sending letters. Letters are increasingly a lost form of communication these days as the convenience of the internet and messaging takes over. Indeed, why bother writing a letter when there are so many complications involved – you have to write, you have to get a stamp, you have to go and post it, and it takes time to get to its destination – when you can poke your recipient and tell him or her the same things without cost, with so much lesser time and a lot more efficiently? Personally, writing letters is a therapeutic act for me. And I’m glad for the fact that letters are so rare today, because this only makes my letters more special and hopefully, cherished for my recipients. At least, it should be interesting to receive a private letter in the mail in the midst of all your bills and official letters. But writing a letter is not always easy. In fact, it’s very difficult – especially writing by hand. It’s not like writing a blog post, where I can edit and edit and mull over for days, weeks or months just to correctly and concisely get my message drafted out. No, a hand-written letter is often less structured and less guarded than an email message or a face-to-face conversation. 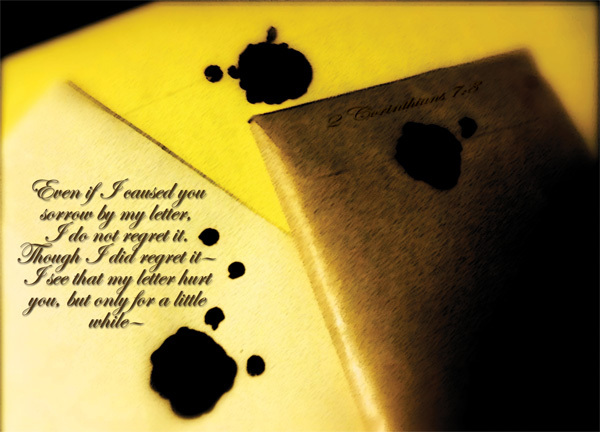 Everytime before I send a letter, I would pray that it would not stumble its recipient. It is with great empathy that I regard this verse by Paul, then. Paul’s epistles took up a large percentage of the New Testament’s epistle books, and surely, beyond the bunch that was recorded in the canonical Bible, he would have written other private and public letters as well. We do not know, but at least in those days there was no other way of distance communication. In this study, we will look at Paul’s attitude as the writer of letters and his consideration for his recipients. Even if I caused you sorrow by my letter, I do not regret it – the Church of Corinth was in a rather dire state when Paul first wrote to reprimand them. In a city where two-thirds of the 700 thousand citizens were slaves, it was a city of excellence and intelligence, where people did their parts as Christians on the surface but failed to live up to the Christian life on the inside. The Corinth Church was glamorous on the outside, but rotting in the inside. The epistle of 1 Corinthians in particular – which was likely not the first letter that Paul had written to them as 1 Cor 5:9 suggests there was an earlier letter in the similar mould as 1 Corinthians – was filled with very fundamental teachings on issues that the people of the Church of Corinth were struggling and failing with. Now, if anything, Paul wasn’t always a nice person. He was in all sense of the word – strict, and firm on his principles that were rooted in the basis of the word of God. Not that he wasn’t loving, but he adopted the ‘bad cop’ role. He was often to the point in his chiding of wrongdoings, and that was something that had always alienated people from him. John Mark was a good example, Paul’s righteousness and principles caused a huge rift between Barnabas and Paul, and while Paul eventually forgave and worked with Mark later on in his life, there was no record in the Bible that he and Barnabas ever made up or ever met again. We often read and quote Corinthians easily, and often without too much thought, but imagine if you were a member of the Corinth Church? Imagine you were doing all the things that Paul scolded the people for in his letter. Imagine the hurt and the persecution that you must feel when you read or hear about the letter! It would take a big man to be able to own up and repent. And eventually, that’s what the Corinth Church managed to do. Though I did regret it—I see that my letter hurt you, but only for a little while— Erm, wait, so did Paul regret it or not? Regret is probably a feeling, and feelings are probably not absolute. In Paul’s case, he cannot bring himself to regret writing to the Church of Corinth to reprimand them for what they were not doing right and to advise and teach them on what they should be doing instead. In this case, he cannot regret the content of what he wrote, he cannot regret it for it was the right thing to do, and not doing so would instead be a wrong. Yet because of the content of his letter, he has caused them to be pained, and for that, he was regretful of. Surely, if he had known of a way that could correct their ways without bringing them pain, he would prefer to do it instead. Yet his regret was temporary, as their pain was temporary, for they were repentant, and in the end what Paul had for the Corinth Church was no longer reprimands but praise. It’s rather conflicting when writing a letter, especially because it feels like you’re just throwing a bomb to somebody without giving him or her the chance to defend himself or to correct your accusations on the spot. There were many times I walked back from the post office regretting my decision to send a certain letter – you never know how a person would receive it. Even the kindest intentions could be heavily misread. But then again, there’s no point in writing a letter that you wouldn’t be sending. Paul could have written a letter only of accusations. Surely it would have been a lengthy letter in its own right, at the state that the Corinth Church was in! But no, his advice and his teachings far outweighed his reprimanding. Although his recipients might be hurt by the chiding, they were able to see what they should do and repent – there was a ‘next step’ to it; instead of just leaving them there in anger and confusion. I enjoy letter writing, and while I do not receive as many letters as I send, it’s not like I have never sent or received letters that hurt as well. Are there letters that I still regret having sent? Yes – there are. Not for the content, but for the fact that I caused hurt. The art of writing letters is a never-ending lesson to me. The regrets will remain, but hopefully, they won’t last long. If you can’t get through to a person, I encourage you to try writing. Not just for the person’s sake, but for yours as well. Make sure that letter benefits the other in some aspect, and pray for the person before you send it. You may be surprised at the result.